If you are a birdwatcher, you should come to Alaska for the 246 native species and the dozens of migratory species that pass through the state. At least 445 Alaska birds species have been documented and an additional 37 have been reported but undocumented. Alaska is a birder’s paradise thanks to its diversity of habitats, location on migratory routes, and boundless wild lands. From the Arctic pack ice to the rainforests of Southeast to the windswept Aleutian Islands, nearly 500 bird species populate or pass through the Great Land seeking breeding, overwintering, resting, and refueling sites. Wading birds, shorebirds, and waterfowl rely on Alaska’s vast wetlands, lakes, and rivers, as well as its more than 40,000 miles of coastline. Migratory and resident songbirds, woodpeckers, and raptors seek shelter in its expansive forests. Exotic Asian “strays” that wander off course often wind up in Alaska and onto the life lists of delighted bird watchers. Find out more Alaska bird information from the Alaska Fish and Game website. Herons are big birds, but they’re lightweights. Standing about three-and-a-half-feet tall, with a six-foot wingspan, a grown heron weighs just about six pounds. While many birds leave Alaska in the fall, some great blue herons stick around, wintering in Southeast and fishing the wetlands and shorelines. The Bald Eagle was officially declared the National Emblem of the United States by the Second Continental Congress in 1782. The bald eagle is a magnificent and majestic bird. Bald Eagles can weigh up to 14 pounds and attain a height of 3 to 3 1/2 feet. They have a huge wing span of 6–8 feet. Typically, the female of the species is larger that the male and bald eagles living in the north are believed to be larger than ones in the south. They can live up to 30 years in the wild and even longer in captivity. Tufted Puffins breed only on islands and rocky cliffs in the arctic waters of the North Pacific. Puffins are the size of pigeons, but weigh nearly twice as much 2 lbs! In flight they look like flying cigars, moving very quickly close to water. They feed by diving, then flying under water with their wings in pursuit of small minnow-like fish. The Red–faced Cormorant has a very limited range, found only on islands in the cold seas of the southern Alaskan coast west to the Aleutian and Commander islands. Strictly a marine species, the Cormorant prefers rough, rocky coastlines. Mainly a resident bird, but dispersing to nearby seas and south to Kurile Island and St. Michael Island, Alaska, with occasional stragglers to Japan. Ptarmigan live in alpine and arctic tundras throughout Alaska. There are three kinds of ptarmigan, and all are found in Alaska. Willow Ptarmigan, Rock Ptarmigan, and White-tailed Ptarmigan, are found nearly everywhere in Alaska’s high, treeless country. The common loon is anything but common. Red-eyed, with distinctive black and white markings, the loon has adagger-like beak that is perfect for its long, underwater fishing trips diving to depths of over 90 ft. The loon is most closely related to primitive birds, and its soliloquy of cries can sound eerily prehistoric. Fortunately, Alaska is an excellent location to view and identify sandpipers. The early summer breeding season is the easiest time of the year to distinguish the various species, not only because they are in breeding plumage and are more approachable than at other times of the year, but also because each species of sandpiper performs a characteristic courtship display with unique vocalizations. The lesser yellowlegs is a relatively tame bird and will allow intruders to approach at close distances. It was once a popular game bird but is now protected. The lesser yellowlegs spends the breeding season in grassy meadows, bogs, burned out forest areas and other open areas or natural clearings. You may find them throughout Alaska. The Trumpeter Swan is the largest waterfowl species native to North America. Most Trumpeters weigh 21-30 pounds, although large males may exceed 35 pounds. The male is called a cob; the female is called a pen. With a wingspan over 7 feet, these snow-white birds are truly spectacular. Standing on the ground, an adult Trumpeter stands about 4 feet high. It is an attractive bird to watch, either on the bleak mudflats on a grey winter’s day or along the warm stretches of sand and shingle in summer. The black plummage of the oystercatcher is pleasantly relieved by its orange-red bill, crimson irides and rosy-pink legs and toes. Even the darker upper parts of its plumage show purple and blue and bronze-green reflections. The Bonaparte’s Gull is the only gull that regularly nests in trees. Because they breed in the Far North, these beautiful gulls are most often seen on lakes and rivers during migration or along the coast in winter. They love salmon eggs. To many Alaska Natives, ravens are the creator of the world and the bringer of daylight. Long recognized as one of the most intelligent birds, the raven also has a less than savory image throughout history as a scavenger that does not discriminate between humans and animals. Ingenious and versatile, ravens are members of the crow family, which includes jays and magpies. They are found everywhere in the northern hemisphere and adapt to very different terrain, from deserts to mountains, a feat requiring high intelligence. 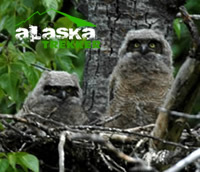 Alaska has 10 species of owls. The Great Horned, Boreal, and the Snowy are just a few of the many owl. One of the largest and most powerful of all the owls is the Great Horned owl. At 18 to 25 inches long, and with a 3 to 5 foot wing span, this common interior Alaska owl is a sight to see. Great horned owls are brown in color, with darker brown spots, white throat feathers and dark cross-barring on the chest. They get their name from their two feathered ear tufts which are neither ears or horns. The sexes looked similar except that the females are larger than the males. The Arctic tern makes the longest migration of any bird in the world. It breeds in Alaska and the arctic, but flies to the edge of the Antarctic ice pack during the winter. The tern flies over 21,750 miles each year – roughly the circumference of the Earth. This excellent flier spends most of its life flying. Spring Birds of Alaska from Dennis Zaki on Vimeo.